Do you find you’re always going up and down in business? Some months are great, some months are, you know, really not good, and you’re always balancing between that struggle and comfortable line and you’re not too sure every month where you’re at? Well, come on a journey with us and we’ll show you how you move from that struggle up into the comfortable zone. Hi, my name is Nathan McDonald, and welcome to another awesome ‘On the Mats’ episode. Today, guys, we’re going to look at what you should be doing when you’re struggling in business and how you move it up into the comfortable zone or even higher, up into the leverage and the success zone. So guys, I’m going to do this on a whiteboard now. 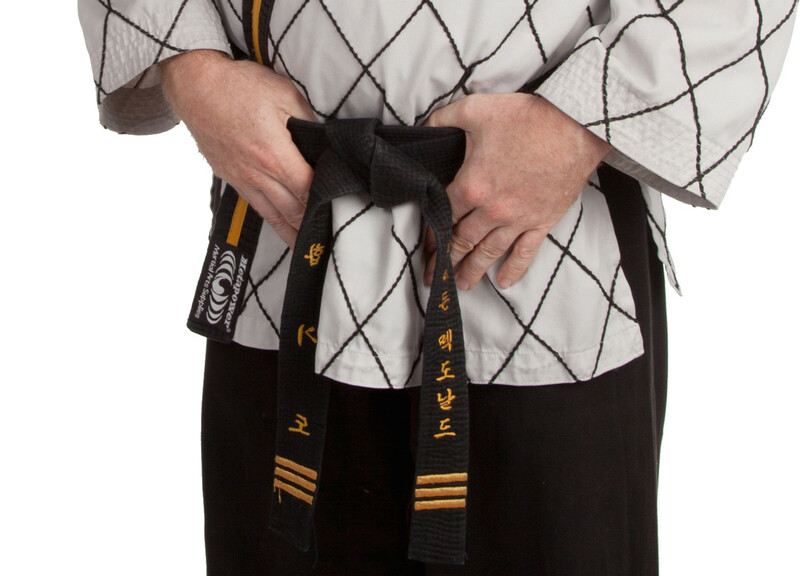 So enjoy, and I just want to let you know – Taki Moore showed me this model – a good friend of Black Belt Business’s and Black Belt Results – and he showed us that. We’ve just expanded a tiny bit more to help you understand and point out exactly what you should be doing. So please, go and enjoy. 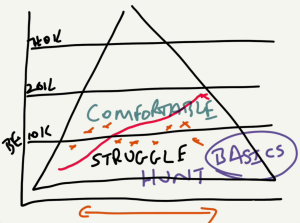 Let me explain what we mean by ‘struggle’ and ‘comfortable’ and ‘success’ and where we’re going from there. What we want to have a look at – and if we do a quick little diagram here – and excuse my writing guys if you can’t read. If we had this broken down into a couple of areas – and the triangle represents your business – and let’s say this was your break-even point here. So let’s say your break-even point was 10K a month in business, let’s say this was 20K, let’s this was, you know, let’s say 40K and upwards. Reality is, if you had a look here, this zone down here is in struggle because effectively you’re not making the cash you need; you’re not, maybe, having the time – this can reflect time, money, it can…it can represent enjoyment level as well. But reality is, what normally happens with business is instead of just sort of like going through the motions and just moving forward – let me just change color here – what they’ll find is, you know, if this was time down the bottom here, and you can see time here – and effectively one month they’ll be, yep, just a bit here, and the next month they’ll be here, and – oh look – they might go up here, but the next thing you know they come back down here and down here and then up here and here and here. Because what they’re actually not doing is looking at the comfortable zone here – and this, if we call this comfortable, nice and easy – reality is, they’re just, they’re floating between comfortable and struggle, and this is very common when we meet business owners. So the whole idea is – what we want to do – is be able to move you out of comfort and effect – or struggle, sorry – and actually be able to keep moving forward the business up to here. Because when you’re up here you’re able to do a lot more; you’ve got more money, you’re not really worried, you’re not really stressed about finances, and you’re able to actually start spending money on some of the stuff you may need, like team and really good processes in your equipment et cetera. So what should you do when you’re in struggle? Well, reality is the first thing that you need to do – let me just change color here – is go back to basics. If you’re down in this area here, you go back to basics. 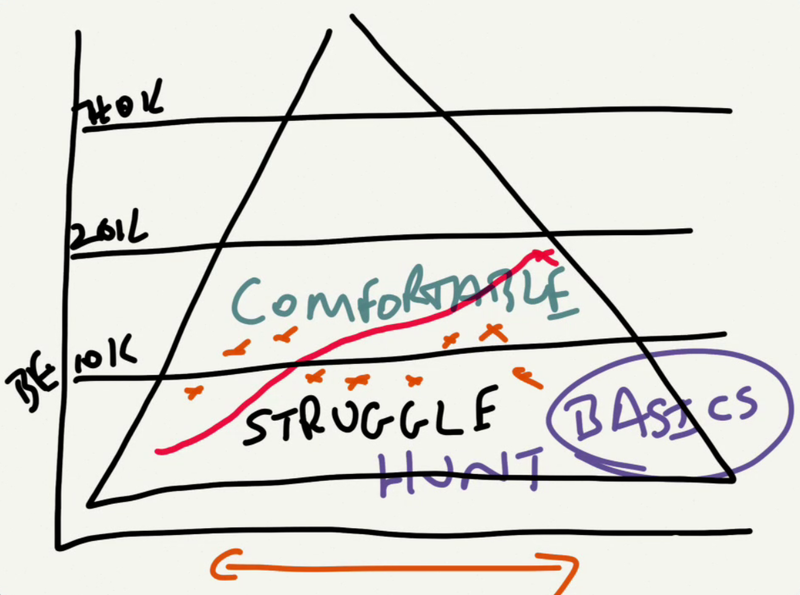 And basics in struggle area…what you should be doing is hunting. This is all about hunting; this is all about just bringing cash in, because you’re in struggle. What a lot of people do is they’re sitting there trying to build the next program or trying to build this or trying to build that. No, you just want to get down to pure basics. Don’t over-think it; just choose one or two marketing techniques that you know that work, and go ahead and get leads if that’s what you’re struggling with. Or if you’re struggling with cash, go back to basics – have a look at all of your expenses that you’re trying to get out. And that’s what we do at ‘The Path to Business Mastery Course’ – we go through in making sure all your basics are set so you can move out of struggle into comfortable and to stay in comfortable. Then you can start building the business, putting team on and spending money where you need to. So guys, imagine you actually graph this every single month to make sure that you’re always heading above struggle and keep moving forward. So guys, time to get out of struggle. So, did you enjoy that? Well guys, this is what ‘The Path to Business Mastery Course’ is all about. We are there building those foundations and taking you from struggling up to definitely comfortable. My name is Nathan McDonald, I’m an Aussie, business is my passion, and my message is global. Have fun and bye for now.